These new (first?) 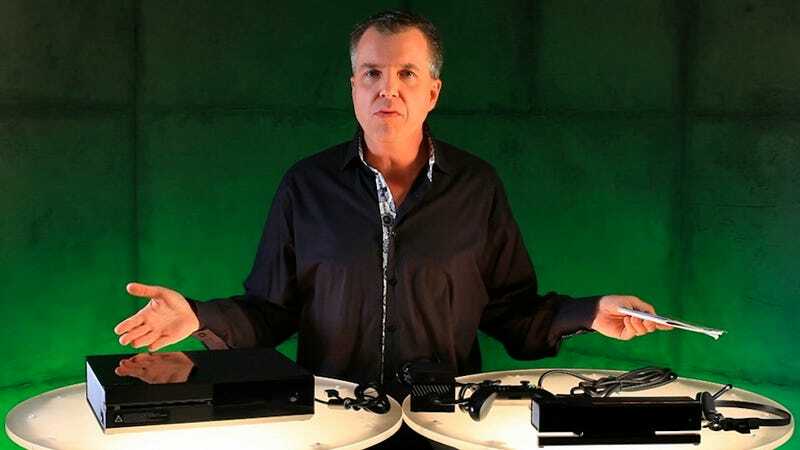 impressions of home Xbox One ownership come up at about 11 minutes into a podcast interview between Xbox hype man Larry "Major Nelson" Hryb (pictured above) and Xbox head of game development Phil Spencer. To give you some context, they've just been talking about the next week's Gamescom show in Germany, where there will be a short Xbox One event (Spencer promises that, at Gamescom, they'll be "talking about some unique exclusive coming to the platform; we're going to talk about Europe's biggest franchise... we have some stuff." Presumably the franchise he's talking about is FIFA. The exclusive better be Blast Corps 2, but is most probably not and never will be. We'll see.) Spencer also talks about his love of playing DOTA 2 and his happiness with the progress that Xbox One launch game Ryse is making. Their talk is mostly gaming. Phil Spencer: Like you, I have my Xbox One at home now. Larry "Major Nelson" Hryb: Right. Spencer: It does change everything. And then I think about games as showing up as a first class form of entertainment for everybody. Because, before, I was really either on my Xbox 360 or on my Comcast TV box. And those two things: never the twain shall meet. There was no overlap. Now, as I'm sitting there playing games, I can instantly go over and watch and see what the Mariners score is or watch something on TV. And vice versa: I'm always socially connected to my [Xbox] Live community, no matter what I'm doing on the box, all of my entertainment comes through the box: movies, television and games. And it's just learning… all of the stuff we've learned about social games on Xbox 360 now comes to every form of entertainment. I'm probably as excited about what this means for TV and movies as I am for just watching games right next to the season debut of Breaking Bad last night. And what a great place for gaming to show up on every television. Spencer: The simple thing of having my favorite TV shows and they follow with me from box to box as I move around, assuming I ever have more than one Xbox One in the house..
Spencer: Or I go someplace else. Or my wife sits down and she's auto-logged in and its her favorite TV shows. And I don't have to remember what channel number such-and-such channel is on. It just knows what I want to watch. And then they go back to talking about games. 1) Obviously, Xbox people are going to say lots of nice things about having an Xbox One at home, though I wouldn't be so quick to disregard anything they say just because of that. 2) They seem rather taken by the ability to swap between games and TV, which goes back to the question: Do you/we/I care enough about live TV for this to be a relevant function? And/or, would we go back to watching more live TV with a set-up like this? 3) The features these two men describe rely on a combination of some sort of persistent cable and/or online connection (for the TV stuff), and Kinect (for the auto log-in stuff). If the experience is as great as they're saying, perhaps it'll become more clear once the Xbox One launches why Microsoft used to think that online and Kinect requirement would be appealing to a of customers. Thoughts? Anyone else out there have an Xbox One in their homes? Or a PS4? Or... I don't know... a new next-gen blender?